1. Noto is an analyst by training. Surely he will "analyze" the heck out their Marketing initiatives. 2. Twitter is in a marketing rot and a fresh look (someone who has NOT handled) Marketing will be good for them. 3. Twitter's CMO search has been going on for a long time without finding the right person. 4. Noto is consolidating power. Aside from Marketing, he heads Corporate Devt, Strategy and Real Estate. Kind of like ONE voice to speak for the company aside from Costelo who doesn't have a good PR rating right now. Ironic that Noto's initial Twitter claim to fame is his misstep on a tweet! I read somewhere that Noto's first job is to market himself within the office as employees are asking why he is getting $70M but employees (aside from engineers) can't get a raise and be at market rates. Company: Analytics-Based Performance Management L..
Samuel ... Although your suggestion will be viewed as radical it is points to an issue. There is a wide gap between the CFO and marketing and sales. It needs to be closed. You have raised a relevant topic. Thanks. More than ever marketing is now being driven by predictive analytics, algorithms and data rule and trump the old "gut feel" methodologies. More information to manage, no wonder the role is moving towards finance. SaaS CRM packages aggressively sell themselves based on predicted ROI, so moving this to the CFO is no surprise. 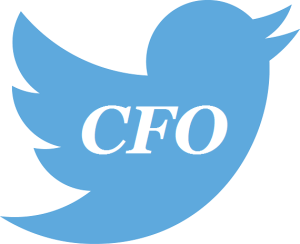 With more diverse stakeholders coming into Twitter, it seems natural to pass marketing to the Finance guy. I mean, how convenient? I remember the first time when my direct boss turned out to be a formerCFO whom had excelled in different health settings. Imagine everytime when I talked to him; he would asked me to speak his language. "Make me a forecast! Give me a spreadsheet !" So long Twitter, for your demise is just around the corner. The CFO will strive his best to kill all forms of gut feelings aka creativity. Those who are savvy in numbers crunching will survive. To those of you whose passion lies in brand engagement, well, it is time to look elsewhere. 1. MARKETING’S NEEDS. The biggest current flaws in Twitter’s mktg dept are ones that particularly lend themselves to a CFO’s expertise. 2. THE CFO’s SKILL SET. This particular CFO, by virtue of his skill set or perhaps because of some prior experience, actually looks like a potentially good Mktg VP. 3. GROOMING. The CFO is under consideration as the next COO or CEO. 4. SIGNALING. This is not a permanent move, and the CEO and CFO both know it. The goal was to send a very loud msg to the entire mktg dept, while a Mktg VP search is underway. 5. WHAT TWITTER MARKETING REALLY NEEDS. Perhaps through an unusual combination of circumstances of industry and company dynamics, a CFO’s skill set actually lends itself to managing marketing. 6. THE CFO LOST A BET WITH SOMEONE. Sam - I just took over the Marketing department last week and your points above mirror the logic behind my CEO/Boards decision. Congrats James. I'd love to hear about what you end up learning with this new responsibility. I'm with Robin on this. I don't know what's wrong with Twitter's marketing department, unless it's the company's overall business model, but I do know one thing: a move like this is virtually never going to end up well. Marketing depends on things the CFO is typically not good at, like creativity, market sensitivity, (reasonable) risk taking, vision beyond the numbers. We need both to sort out the best course of action and the best metrics to measure success. The difference between finance and marketing is one of the strengths of any company, because only through that "conflict" can the best ideas come to the forefront. It's the job of the CEO to blend them into the company's strategy. Without that conflict - likely to be stifled when one functional head (either one) controls both - the strategy is seriously hampered, perhaps fatally so. I’m inclined to agree with Gene & Robin here. Robin’s characterization of CFOs as soul-less number crunchers is a little unfair, and it may be that Noto actually has a skill set to be a good marketing CFO, but in the long run marketing and finance require two fundamentally different mindsets. And as Gene points out, the tension between those mindsets is critical to most successful businesses. So notwithstanding my somewhat flippant earlier comment, for Twitter’s sake let’s hope this is some sort of interim strategy. "CFOs as soul-less number crunchers"
Sounds like a great blog topic, no? I think we all agree that the CFO, and the finance function, can make great contributions to meeting corporate goals. But, in general, I can see Finance diluting their reputation for being an impartial "umpire" if they are also managing a team competing for corporate resources. Maybe Randall has it right - this is a temporary move until a permanent Marketing VP is found. In my experience many marketing folk are innumerate and having the business function that spends a heap of dosh and is responsible for orchestrating revenue generation report in to the CFO may make good sense. Media reports say that the move is Interim. I'd tend to agree with the sentiment, until a new CMO is hired.